How 2019 came to have such special significance for the public domain is a sordid story of congressional incompetence, international treaties, and Mickey Mouse. The United States was the second country to adopt a general copyright law passing the Copyright Act in 1790, which protected maps and books for a term of 14 years and another 14 years if renewed. Interestingly, the Copyright Act was passed with minimal discussion and was taken almost verbatim from Britain’s Copyright Act, The Statute of Anne, which passed in 1710. 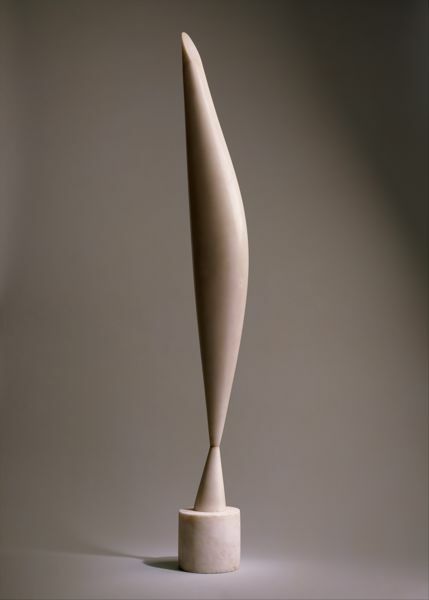 Bird in Space by Constantin Brancusi. Printed in 1923. Over the next century, Congress broadened the scope of protection to include more types of creative works. At the same time, countries around the world began to embrace the idea that their countries benefited greatly from protecting intellectual property. However, the United States became an outlier in how it defined the term for copyright, focusing on protection of the creative work over a fixed period whereas other countries gravitated toward protection based on the author’s life plus a certain number of years following it. Unfortunately, the US copyright system was incompatible with the rest of the world so when a group of sixteen countries (including France, Germany United Kingdom and Canada) convened in 1887 to sign an international copyright treaty known as the Berne Convention, the United States did not join. Because foreign works did not have this requirement, they automatically became part of the public domain in the United States. This created tension with other countries, including important political allies. The US also continued to be the only country that viewed copyright terms based on publication, making several revisions to copyright duration. By1909, the copyright term had grown to 28 years with an additional 28 years if renewed but it wasn’t until 1955 that the US began to seriously consider harmonizing its copyright laws with the members of the Berne Convention. Due to various disagreements by members of Congress, the overhaul process took 20 years, during which time, Congress passed nine interim extensions to copyright duration. Finally, Congress passed the Copyright Act of 1976, which changed the copyright term to the life of the author plus 50 years. Several patches were retroactively implemented to deal with works already created and published under the old copyright rules. To complicate things further, in 1989 the United States joined the Berne Convention, which necessitated the removal of several key components of US Copyright law to comply with the treaty rules. For example, the condition of including the copyright notice and to register with the US Copyright Office was no longer applicable. As well, another condition of the treaty gave many foreign works copyright protections that were previously in the US Public Domain. Additional rules were also required to maintain copyright protection on works that would normally have entered the public domain under the previous US rules, even some that did not renew their registration or have a proper copyright notice. Then in 1998, came a copyright power grab. Congress passed the Sonny Bono Copyright Extension Act, which added an additional twenty years to copyright duration for individuals (life of the author plus 70 years) and for companies, the copyright term became 95 years from publication or 120 years from creation, whichever came first. As we discussed in How Mickey Mouse Keeps Changing Copyright Law, the Sonny Bono Act has been widely viewed as a way to keep Disney’s Steamboat Willie (1928), the first appearance of Mickey Mouse in film, from slipping into the public domain. It is seen as a prime example of successful corporate lobbying, although admittedly, Disney’s intervention is more conjecture than proof. More importantly, and the central reason as to why 2019 is such an important year for the public domain, is that the Sonny Bono Act also fixed a period of 95 years for anything placed under copyright from 1923 to 1977. As a result, many works received an additional 20 years of copyright protection significantly decreasing the number of works entering the public domain during those two decades. However, as of Jan 1, 2019, the extension has expired bringing the entire 20 years’ worth of creative works into the public domain, all at once. Itis the largest collective copyright expiration in recent memory. As well, without the extension, we can expect a more normal parade of works entering the public domain works every January 1st. For over a decade, Google, libraries, educational institutions, the Internet Archive, and other organizations have been digitizing millions of public domain works and now there is a virtual treasure trove of works to add. Expect to see many of them popping up in your internet search results. These are our property now, as a society, so we should all take advantage of these works so they aren’t lost to history. Have any of your favorite creative works entered the public domain? Let us know in the comments section below.